Regina, African-American women’s skin varies from light to dark and every shade in between. Even though companies have gotten better about offering makeup for African-American women, it can still be difficult to find the shade that best matches one’s skin. If a woman chooses the wrong shade, it will make her skin look too dark or pasty. One of the lessons Nate and I teach at L.F.I Makeup Academy is selecting the proper foundation and concealer for your skin type and complexion. Foundation doesn’t look the same on skin as it does in the container. Thus, it’s important to test in natural lighting and not artificial light which will give you a “false match” and test foundation along the jaw line or the wrist to see if it matches one’s skin tone. In the case of uneven or blotchy skin tone which most women of color have, darker on perimeter and through jawline line and lighter everywhere else, two different foundations can be used to even out the complexion.Color isn’t the only thing to be concerned about when choosing a foundation. Skin type plays an important role. 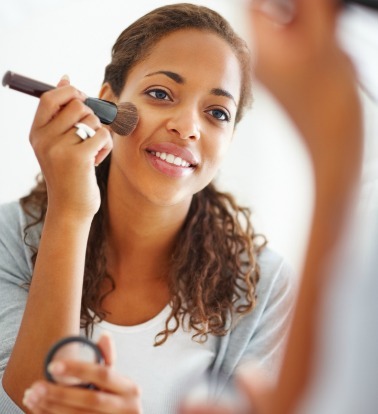 Women with normal to oily skin may want to choose a water-based liquid foundation or a powder foundation. Women with skin that tends to be dry should try cream foundation. To obtain a flawless complexion, moisturizing is important. You want the foundation to blend seamlessly into your skin Regina and skin that is not moisturized can appear streaky, ashy or chalky. Facial moisturizer should be applied to slightly damp skin after cleansing and allowed to dry before applying foundation. Women with oily skin need to make sure to choose a product without added oils, either water-based or oil-free. Black Opal. I was so enamored with Black Opal’s True Color Liquid Foundation because it gave such a beautiful finish and was priced so right at just $8.95. They offer a range of foundations in several formulations to suit your skin type. Bobbi Brown. Makeup artist Bobbi Brown is known for her beautiful and natural makeup looks so naturally her makeup line offers foundations that do the same. Her foundations come in a wide range of skin tones and has formulas for every skin type. This is the brand that i use 90% of the time. A bit pricey but I LOVE IT! Prescriptives Virtual Matte foundation. It absorbs oil and goes on very smooth. It also has an SPF of 15. Precriptives foundations match your undertone that way you get that flawless skin look that matches your skin. Regina you can find this product at department stores or online. Iman’s Luxury Radiance Liquid Makeup it’s “Enriched with minerals” which simply means that this oil-free foundation contains vitamin E, micro-mineral pigments and a plant extract complex of Acia and Magnolia. These minerals not only help hydrate the skin but also assist in enhancing the skin tone. This foundation gives a semi-matte finish and includes mica pearls that add a bit of a glow to the skin. You can now find this at Target Stores, some Walmarts or Walgreens drug stores. Thanks For your question and let me know if one of these works for you! Posted on June 12, 2013, in Ask Wil!. Bookmark the permalink. Leave a comment.